Sushi is not only a nutritious and healthy food option for parents and kids alike, but there are many ways it can be enjoyed; whether you’re making it at home and packing for school lunches, or buying hand rolls for a day out with the family, Sushi is a definite crowd pleaser. Smell: There shouldn’t be one... Fresh fish should have no smell at all and neither should the restaurant. Condensation: Condensation inside the packaging is a sure sign that the product has been held in conditions that have had variable temperatures. You want clear, clean packaging, which reveals the product has been held in a constant chilled temperature to lock in the freshness. Look closely at the product: The firmness of the flesh of the fish, clean bright, white rice and the crisp wrap of the nori are all signs that your meal is the freshest it can be. There’s no excuse to be consuming tired hand rolls or seafood that is past its prime. Ask the question: Don’t feel afraid to ask the staff what date and time your meal was prepared. The better the sushi shop, the more recently your food was prepared. Even better, ask if they have a sushi chef in-store. At Sushi Sushi the food is made fresh each day, from fresh seafood and vegetables that are delivered every morning. All of the dishes are made in the store by a trained sushi chef, and not pre-prepared off site. To store your Sushi for day trips and school lunches ensure you keep it at a cool temperature to lock in freshness, unsing a cooler bag or lunchbox with removable ice pack. Some retail stores like Sushi Sushi will offer you a cooler bag with purchase – so be sure to ask for one if you intend to eat your sushi later that day. Try your hand at creating sushi at home with this simple recipe and get creative in the kitchen. Possibly the best part of making kids sushi is that you can mould the rice into any shape – making it equal parts nutritious and fun. The sky is the limit when it comes to sushi fillings, and there’s no right or wrong way about it. Add uncooked rice to the 3 cups of cold water and bring to the boil until cooked. Rinse rice thoroughly with cold water & put into the fridge to cool completely. Add 2 tablespoons of rice wine vinegar (or brown rice vinegar for brown rice) to the cool rice mix and give it a good stir. For traditional sushi rolls, place a nori sheet shiny side down on your bamboo mat and flatten out approx. a 1⁄4 of a cup of rice in a rectangle shape leaving around 2-3cm of clear nori closest to you, then add your fillings and get rolling. To stick together, brush your nori with water. Use a sharp knife to cut. For a fun alternative you can use sushi moulds (see here) to create cute pandas your kids are bound to love. 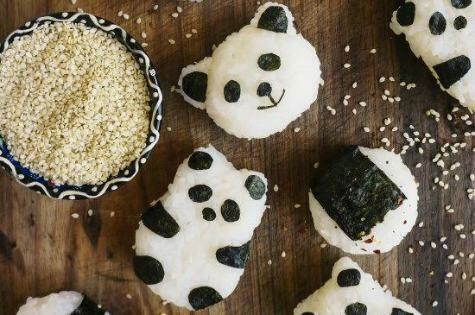 Stuff the pandas with your chosen fillings, creating a nori decorated rice ball, sure to shine in school lunches. Notes: Pick up sushi rice, Rice Wine Vinegar, Kewpie Mayo and Bamboo Mats from the Asian section in your local supermarket. We absolutely recommend Real Food liberty forge wedding and were genuinely confused about the reviewer that rated them so low. We only heard good things from our guests and personally experienced an amazing time at our wedding. In fact, after I told my husband about the negative review, he felt Real Food had been so wronged that he decided to write a review himself!